The Leadership Texarkana Alumni Association developed the annual program of awards for Community Leadership in 1992, under the co-chairmanship of Leadership Texarkana graduates Eddie Farnsworth and Barbara Bennett. The first event was called First Annual Community Achievement Night, held the evening of February 28, 1992. LT Grad and team member Janet Elwood suggested naming the awards in honor of Wilbur Smith, and from 1993 on, the awards program itself has carried Wilbur’s name. 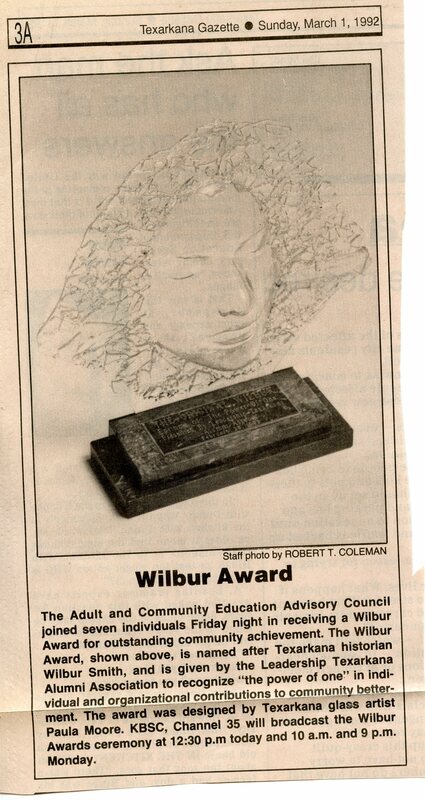 In 1993, the Wilbur Awards program was held in the Perot Theatre, with Wilbur Smith as the honored guest and with entertainment provided by local cultural organizations, including Texarkana Repertory Company and the regional choir, among others. The original program of awards included multiple categories for honoring leaders, including Cultural and Historical Causes, Basic Human Needs, Education, and more. All nominees were profiled prior to the awards in a full color tabloid compiled and published by the Texarkana Gazette; all nominees were also interviewed and profiled in video format by the TISD Tigervision crew, with the video shown the evening of the Awards presentation. The award which was presented to the winner named in each category was an original glass artwork, a glass face poured from a local model and designed and crafted by local artist Paula Moore. These proceedings required elaborate planning and abundant resources, as well as large numbers of individuals in every field willing to nominate worthy honorees, and a signature artist willing to continue to allocate her resources to the awards continuation in the original format. Within five years, the awards program was scaled back significantly with regards to categories of honorees and in presentation logistics, but LT continued to seek out and honor exemplary individual (youth and adult) and organizational leaders throughout the community. For many years, the awards were presented by an awards team making surprise visits to the honorees’ workplaces. Since 2010, with the advent of the Annual Lunch for Leaders, the annual awards presentation has been a part of that annual event, with all worthy nominees in the three categories recognized during the luncheon program. All honorees/nominees are invited as guests of the organization to attend and be honored. 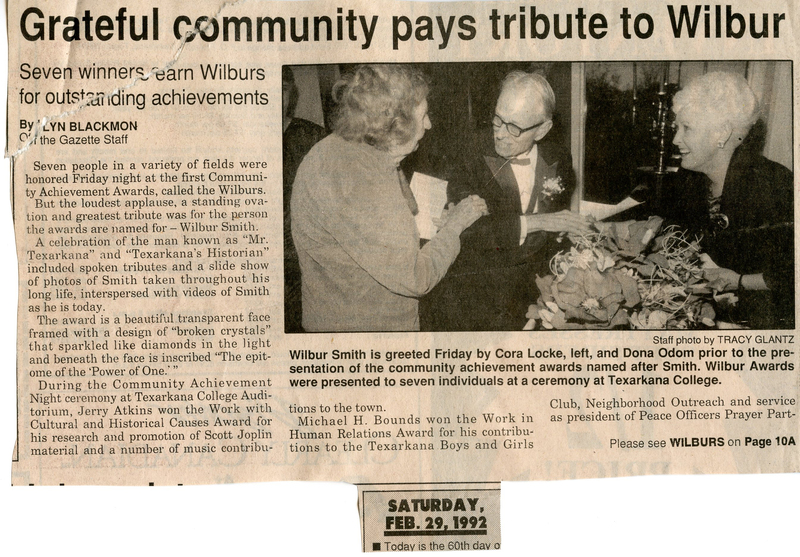 In 1992, when the Leadership Texarkana Alumni Association began an awards program to recognize outstanding community leadership in Texarkana USA, the founding committee decided to name the awards after Wilbur Smith, recognizing how he symbolized the power of one individual to have a positive impact on a community. Wilbur Smith was a noted public servant to Texarkana for many years. Born on October 5, 1902, in Texarkana, Mr. Smith graduated from Texas High School on May 23, 1919 and his professional career included working for Texarkana National Bank, as an assistant traffic manager for Southwestern Transportation Company, and as division manager and later emeritus agent for Prudential Insurance Company. Mr. Smith dedicated his time and energy to Texarkana, contributing his time and energy to numerous civic organizations, including the Texarkana Chamber of Commerce, the Jaycees, the Texarkana Community Chest (which was a predecessor to the United Way), the Texarkana Rotary Club, as well as serving as a valued member of the Presbyterian Church of the Redeemer, Boy Scout Troop 1 and the Knights of Templar and Shrine, and numerous other organizations. Mr. Smith became a local celebrity for his comprehensive knowledge of the community and its citizens, past and present, as well as for his talent for storytelling. Because of his renowned city pride and devotion to the history and people of Texarkana, he was one of the founders of the Texarkana Historical Society and Museum and was bestowed the title of Town Historian. Throughout his lifetime, he earned the admiration of the townspeople and a host of accolades and honors, including the C. E. Palmer Award, the city’s highest award for civic achievement and the prestigious Paul Harris Fellowship. In 1997, his Rotary Club renamed itself the Wilbur Smith Texarkana Rotary Club in his honor and in an additional tribute to him, March 21 23, 1980 and October 5, 1987 were declared Wilbur Smith Days by both Texarkanas.